A unique genre within American literature, women's captivity narratives have enthralled readers for generations. 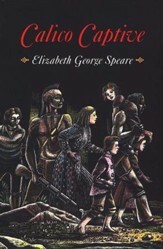 Offering various perspectives, each woman's story offers a particular take on her captivity, whether she eventually joined a tribe like Mary Jemison or took her revenge like Hannah Dustan. Spanning two hundred years, these stories are still as fascinating as when first published. 356 pages, softcover. When the frontier village of Deerfield, Massachusetts was attacked by a party of French and Indians near dawn on February 29, 1704, the Reverend John Williams, his family, and his entire congregation suffered greatly. Forty-nine were killed, among them William's wife and two of their children. One hundred eleven were taken off as captives to Canada, including Williams and five of his surviving children. In The Redeemed Captive, Williams recorded with Christian resignation the terror and trauma of the raid, the long march through the snow and ice, and his years of captivity among the French. His account of the enemy invading his sleeping household and the ensuing ordeal still speaks of the travails of frontier life and of the New England Puritan character that enabled Williams and his flock to withstand these hardships and to return to Deerfield to rebuild the burned and sacked community. Twelve-year old Mary Jemison lives on the border of eastern Pennsylvania in 1758--hardly a safe and quiet place to live. Captured by Seneca tribesmen, Mary was separated from her family, traveling to western New York. Initially missing her family, she soon learns many new things about the earth, its plants, creatures and more...so much so that she starts to enjoy living life as a sister to the Indians. When a chance comes to return to English civilization, will she want to leave them? 298 pages, softcover. The long days on the trail were filled with excitement for adventurous Carrie Talbot. And at the end of the trail waited more adventure- she was going to start a brand new life at the Indian mission established by her uncle. Then a sudden encounter with an Indian raiding party left Carrie with more excitement than she wanted. As she rode off helplessly with her captors, frantic thoughts raced through Carrie's mind. Why was one of the Indians so interested in the family Bible she had managed to save? How could she escape? Even if she did, how could she ever find the wagon train again? The raiding party took Carrie deep into the wilderness to a Cheyenne camp on the banks of a distant river. 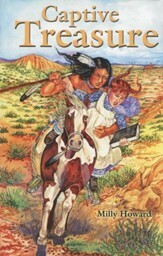 There Carrie met the Indian called the Keeper and began a life far different from any she had ever imagined. 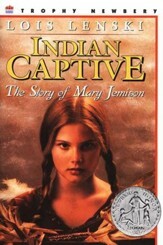 Based on a real diary, Miriam and her sister Susannah, along with her husband and children, are captured by Indians during the raids of the French and Indian War. Forced to march to Canada where they believe they'll be sold, from a rare night of partying to a grueling walk through the New Hampshire woods, Calico Captive traces the long trail of a family's trip from New England to Montreal to England and back to New England again. 274 pages, softcover.